Sonali Shivlani Internationally Certified Pregnancy Consultant and a Child Nutrition Counsellor helps you understand your labour and when you’re ready to head to the hospital to give birth to your bundle of joy. As you enter your ninth month, with every cramp and every movement, your first thought is, ‘Is this it?’ Now, if this is your first pregnancy, there’s a good chance you’ve been to the hospital thinking it’s time, only to realise it’s nothing but a false alarm. Let me assure you, this is completely normal and most first time mums will have a few false alarms before the real thing. However, before the real deal, your body will give you some clues as it prepares for labour and birth. If you are alert, you might be able to spot these signs and symptoms, and correctly differentiate between pre-labour and labour. Your baby will begin descending into the pelvis between week 35 and 37. Moms can help this natural progression by doing exercises recommended by their doctor. Some of these include walking, half squats and the butterfly postures. In the last few weeks, expectant mothers will also notice an increased number of Braxton Hicks contractions as the body prepares for actual labour contractions. Women who experience Braxton Hicks contractions are usually experiencing what is called false labour as Braxton Hicks do not have any action on the cervix. These contractions are short, sporadic and relatively painless and can feel like a hardening of the abdomen and a subsequent relaxing. A little closer to their due date, expectant mums may also notice mucus discharge with some blood streaks, mild cramps in the lower back, a feeling of frequent urination and an extra surge of energy. Most women are surprised by this surge in energy and can do almost anything, as the ninth month is generally considered a very lethargic time. Expectant women find themselves shopping, cleaning, cooking and even make time to run many errands. This sudden surge in energy is rather instinctive, perhaps because women are subconsciously aware of the fact that they’ll soon be confined to their homes, and they need to accomplish a lot before the baby comes. If you start noticing these signs, you need to prepare for the birth of your baby. And while it may feel like it’s time, know that you are not yet in labour. It is best to wait at home till labour actually starts. However, if you notice a bright red bloody discharge but are not experiencing any discomfort, then it does make sense to go in for a checkup. Another thing to watch for is leaking. Your baby lives in a bag of water which is called the amniotic sac. This is your baby’s sterile environment. In some cases the bag of water may break —either as a leak or a gush— prior to the onset of contractions. Naturally, this is a sign that you must go to the hospital. If the baby’s sterile environment is now open, chances of infections become higher. However, for some women, despite the water breaking, if labour doesn’t progress, chances are that the doctor will induce labour and deliver the baby. In most cases, contractions begin before the water breaks. To give you an idea what to expect before you head to the hospital, here’s an example. If you start feeling abdominal cramps or spasms in your lower back, and you start to feel uncomfortable, you must begin timing them. Doing so will help you differentiate between real and false labour. 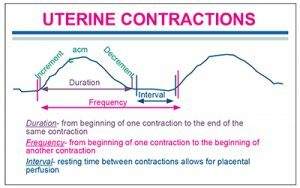 However, when it comes to timing your contractions, you need to make a note of the frequency and duration of each contractions. 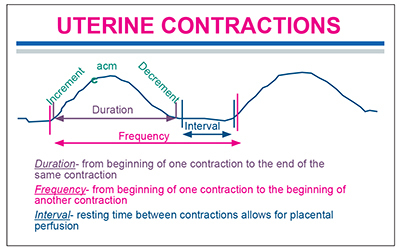 The frequency is measured from the start of one contraction to the start of the next contraction and the duration is measured from the start of one contraction to the end of the same contraction. 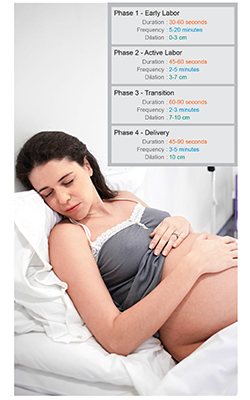 In early labour, the frequency is far apart and the duration is very short, at times a contraction lasts for just a few seconds. However, as labour progresses, the time between each contraction shortens, and the duration of each contraction increases, lasting as long as 90 seconds. If you notice a pattern—the frequency is shorter with the duration longer —then you know that you are in labour and it is time to head to the hospital.